StinkBOSS gives families the best way to get the stink out of their lives! Easy to use and highly effective, it eliminates the odor from athletic shoes, work shoes and all kinds of sports gear. 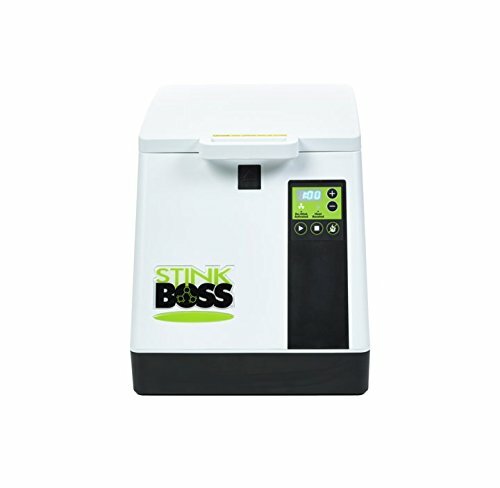 Just place your smelly items inside the StinkBOSS, close the lid, select your settings and walk away. And StinkBOSS will not shrink or damage delicate materials or leather like other harsh disinfectants. StinkBOSS is superior to other deodorizing methods because within its enclosed design, it generates mild heat (70 to 75 degrees F.) and circulates ozone, nature's most powerful disinfectant. Commonly used in hospitals and research facilities to help create sterile environments, StinkBOSS brings this ozone technology into your home. StinkBOSS uses no additives and needs no replacement parts, so there's no waste or recurring costs for use. It offers variable cycle times for a little stink, or a lot! From 30 minutes to up to 6 hours. Ready to use out of the box, StinkBOSS comes with a quick start guide and safety tips to make it easy to operate. And, it's easy to clean. Just wipe with a damp cloth. One-year limited warranty. StinkBOSS comes with a quick start guide and safety tips to make it easy to use. Open lid and place shoes or gear over the formed air vents. Close the lid. Press the Plus button to set time and press the Start button to start. Follow the instructions in use guide for best results. Works great on all your stinky active gear - shoes, pads, hats, gloves - anything you wear but can't put in the washing machine! Helps your pricey gear last longer! If you have any questions about this product by StinkBOSS, contact us by completing and submitting the form below. If you are looking for a specif part number, please include it with your message.